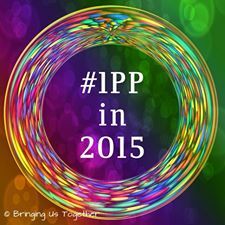 We are so excited to bring you this first instalment of our #1PPin2015 campaign. Over the last few weeks, we have looked at What is a One Page Profile and also how it can be used. Today, we are going to help you to produce the first section of a One Page Profile – the Appreciation section, sometimes called “What we like or admire”. This section looks at the gifts and strengths of the child or young person. It brings together everything that people like and admire about them. As a parent, we often have to complete forms and attend tribunals where the system expects (and requires) us to look at the negatives, what our child cannot do without support, what they need help with and what they are not doing in comparison to their peers. This can be soul destroying and can lead many families down the long, grey, unwanted path of depression. Focussing on negatives to ensure our children and young people get the support and help they need is demoralising. It can lead to you thinking about your child in a negative manner and in the long run, their needs become an obstacle. In a One Page Profile, the Appreciation section focuses on the positives. Parents often comment that this section is their favourite, it reminds them that their child is an individual and they have many positives to offer. Sometimes, this can become difficult for a parent to complete as they are so used to focusing on the negatives. This section can also help children and young people to develop a sense of themselves as individuals. It can have a positive effect on their well-being and can help them to develop self esteem. Knowing that people like or admire anything you do can be a real boost. These are some examples of the sort of characteristics that people like and admire. 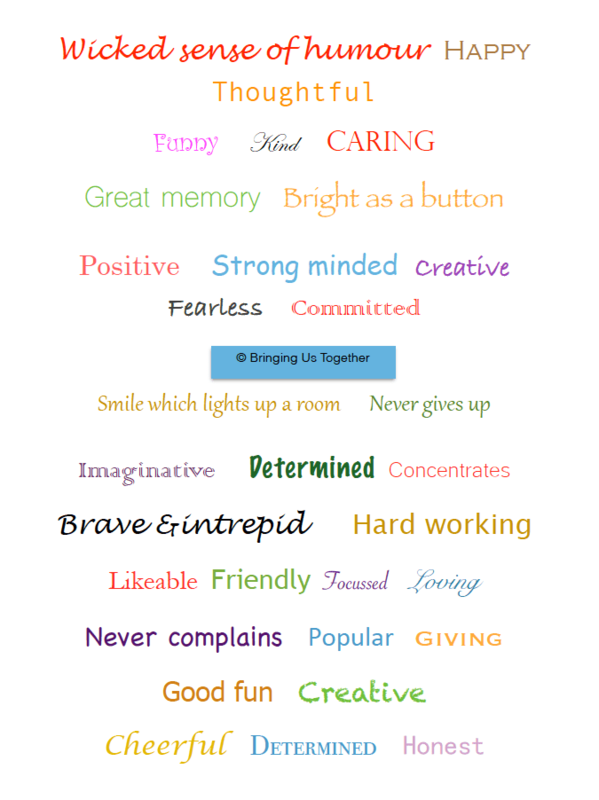 The strengths your child or young person has. For example, they may be assertive, they may be generous with their belongings or they may be trustworthy. We have produced a list of some common strengths in this image. Or you can use Helen Sanderson Associates Appreciation Cards for One Page Profiles as a prompt. Ask the key people in your child’s life. Ask their family – their brothers and sisters, grand parents, aunts, uncles and cousins. Ask the school, the teacher, the teaching assistant. Or if you are a teacher/teaching assistant attempting to do these for your class, ask their class mates and friends. Ask their carers – their Personal Assistant, their short break provider. Ask their transport provider. The list will be different for every child. Send them a postcard asking them to list three things they like or admire about your child or young person. Send them a text. Use Facebook messenger. One tip is to have a white board in your home and when people visit ask them to write down the things they like and admire. This isn’t about academic achievements or any swimming/Brownie/Cub badge. This is about your child or young person as an individual. Now, the swimming badge may be something that is really important to them, so look at the strengths they have used to make this badge possible. Their perseverance, their commitment and maybe their positivity. These are the strengths you want in the Appreciation section. For our younger children, this can be great, most 9 year old girls love to hear what everyone likes about them. You can watch them grow as their self-esteem receives a boost. However, it is one of the most difficult sections for young people to complete. Like most of us, our young people find it uncomfortable to sit and hear what people like about us. Think of yourself and how you feel if people say “oh wow, I don’t know how you do it” or “I really admire how you handle everything”. it can make you feel very awkward. This feeling is much more intensive when you’re a teenager as you are still trying to work out how to deal with all these new emotions and hormones rushing around your body. This section is often best completed by someone other than the child or young person, as it can be really mortifying for anyone to ask people what they like about you. If someone is asking on your behalf, it takes the pressure off. Think back to being a teenager, this is similar to asking your friend to ask someone to go out with you. You want to know if they will but asking your friend to do it takes some of the anxiety away (and you can always pretend it wasn’t your idea if they say no). So, explain to your child or young person what you are doing and why; show them the post card or text message you are thinking of sending; discuss who you will be sending it to and constantly check throughout that they are happy for you to do this. You also need to explain what you will do with the answers and how these will form part of the One Page Profile, and most importantly, what the One Page Profile will be used for. Collect all the responses you have received and together with your child, choose the five or six strengths that your child wants people to know about them. If the responses have words such as “generally” or “sometimes” then rule them out, this implies that sometimes your child doesn’t possess this strength and can be seen as a negative. Look for common words and phrases such as “wicked sense of humour” or “gives great hugs” which make your young person smile when they are read out. This One Page Profile is about your child or young person. It should contain what they want people to know about them, not just what you think everyone should know. This One Page Profile should tell someone who has never met your child about them as they are now. So, leave out any comment that starts with “they used to…..”. If you have any questions, there are many ways to contact us. Either use our Q&A section, email us “site@bringingustogether.org.uk”, leave a comment below or join our Facebook group. Sometimes even for a positive person it just feels as if there is no end! Previous story How can a One Page Profile help?